Night arrives with Evil force. Terror, bloodshed run their course. Brings at last the light of day. Yet to not turn so fast away. All is still not what it seems. The journey to the Ancestral City takes hours, but eventually Ravan starts to descent from the skies to the ground, where the Ancestral City awaits them. 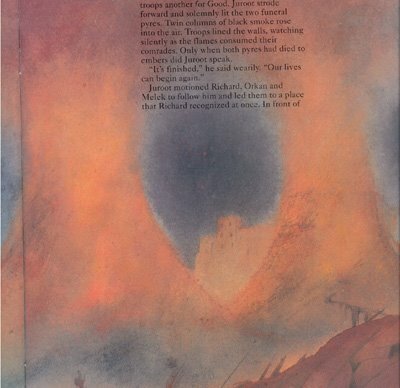 The skies are filled with darkness that can only be created by the Evil One, but Richard is able to make out several campfires on a series of low hills. Beyond this ridge, the Ancestral City's towers and turrets are visible, as is a peculiar light that hovers above the city. Ravan descends and lands upon the ground within the forests on the outskirts of the Ancestral City. Orkan, Melek and Richard climb off the horse's back and find Juroot waiting for them nearby. The Guardian greets them and congratulates them on finding all of the pods, but says that the city must be recaptured before they can be returned to the Tree of Life. With this, Juroot leads the trio to the Council of War. After passing through camps of eager soldiers, they all arrive in a clearing, where many creatures have amassed. 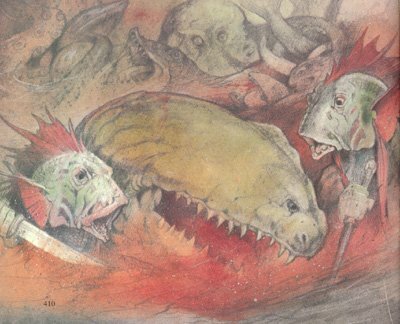 Among the familiar faces to Richard are Oganga, Zard, Kika, and Tuska. 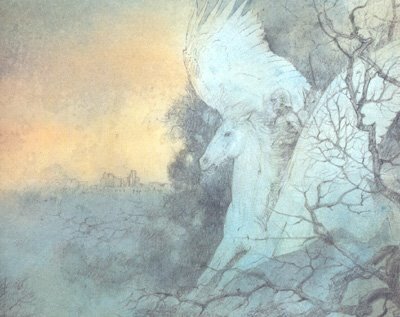 Richard asks where Golan is, and Juroot answers that only Golan's spirit is with them - he will show himself only at the Tree of Life. With the newcomers seated, the council begins arguing how to best enter the Ancestral City. Some argue for a direct attack, others for tunneling beneath the city walls. After a lot of arguing, Juroot calls for quiet and gives his decision: a compromise. The dwarfs will tunnel beneath the city while Oganga's bird forces will distract the Evil One's forces from above. The rest of the forces will surround the city and be ready for the signal to attack directly. The council greets Juroot's plan with enthusiasm and the Guardians begin drawing up their plans of attack. When everything is decided, the Guardians disappear into the forest to sort out their armies into separate divisions. The armies patiently wait for the signal to advance towards the Ancestral City. After a long wait, the signal comes in that the dwarfs have entered the Ancestral City and are ready to open the gates. Richard and his companions, marching in Juroot's forces, follow the Guardian of Truth towards the north gate of the city. 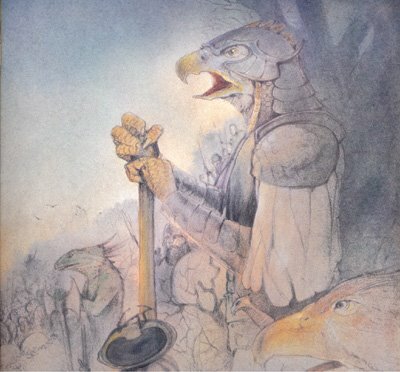 Above, Oganga's birds attempt to distract the Evil One's forces below, many losing their lives to arrows. An insect scout arrives and relays the bad news that the Evil One's forces are amassing at the north gate, preparing to attack; Juroot orders his troops to advance. Soon, a mass of the Evil One's armies pour out of the north gate in countless numbers, marching directly towards Juroot's division. Juroot's men surround the Evil One's army in a pincer formation. 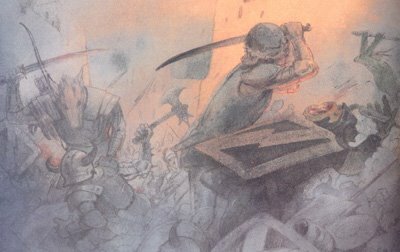 As a group of Landsmen face some Cozards, the Ancestral forces fire flamed arrows at the Evil One's forces. Scorpions burst into flames and Grapfrits explode while earwigs and killer bees twitch to their deaths, throwing the evil army into chaos. A scout warns that the Evil One is bringing out catapults and is preparing an assault on Zard's forces on the west gate. Then, without warning, Richard watches as fireballs are fired from the Ancestral City towards Juroot's army, bursting upon impact and killing all nearby. The Evil One's lack of compassion for his own forces allows him to hurl fireballs at will. 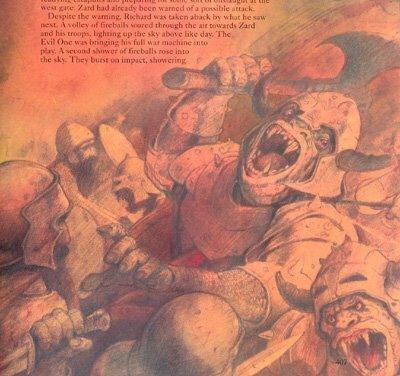 Juroot orders his troops to advance despite an approaching swarm of Grapfrits when he gets word that the dwarves have opened the gates inside the city. With all four gates open, the Ancestral forces surge into the city and attack on all fronts. Inside, Richard sees the city in disarray as the forces of good struggle against the forces of evil. The streets are filled with scorpions, earwigs, Cozards, and killer bees, and some of the weaker Ancestral creatures fall victim to the Cozards' cruel fighting. Several earwigs attempt to attack Zard but are cut down by the Guardian's mighty ax. Juroot is besieged by a couple of Cozards before Tuska joins in. Meanwhile, the oceans are also being fought over between the forces of good and evil. The first to strike are Nemis' ghost sailors, but Doonar's dolphins ram the specter ship until it disappears. Then comes Sumar, the Moss Beast, dragging herself through the mud towards the Ancestral Forces, followed closely by a giant squid and an army of stingrays. 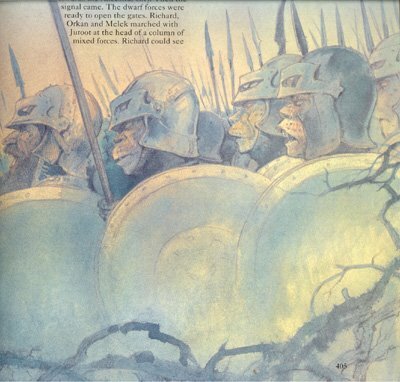 The forces of good are pushed back towards the shallows, where Tolosh await them. But before the trap can be sprung, the Tolosh are ambushed by alligators that had encircled them. The sea turns a bright pink as the Tolish are devoured by the eager reptiles. Emboldened by this victory, Guardians Tishon and Shunta advance their forces and attack Sumar directly. 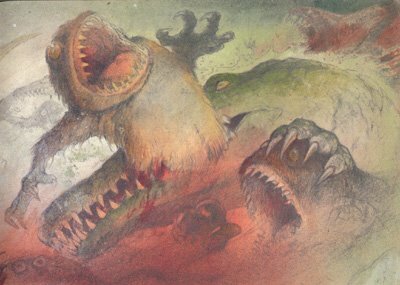 The Moss Beast can't react soon enough and the twin Guardians slit her throat. With Sumar defeated, he squid and stingrays are easy pray to Doonar's dolphins. The few stingrays that escape to the shore are quickly devoured by the alligators. The battle at sea has been won by the Ancestral Forces. Back at the ancestral trail, the forces of good are assisted by a mysterious column of flame that destroys many of the evil forces before dying down. Word of the victory at sea reaches the city and empowers the Ancestral Forces while demoralizing the Evil One's armies. The large numbers of the Evil One's forces now becomes a disadvantage in the narrow streets of the Ancestral City, known more intimately to the original inhabitants. The Guardians lead their troops through every nook and cranny in the city, cutting down throngs of the Evil One's forces stuck in the thin roads. The dead fall quickly now that the tables have turned. Within moments, the battle is over - the Evil One's forces have been defeated. The forces of good begin the task of moving the dead - both good and evil - out of the city. A long process of sorting takes place, and eventually two piles of bodies - one for good, one evil - are erected outside the city walls. The piles become funeral pyres as they are lit, and the Ancestral forces watch along the city walls as their companions are given their necessary funeral. When the flames eventually die down, Juroot wearily exclaims that the Final Battle is over, and the Ancestral World can begin again. The Guardian motions for Richard, Orkan and Melek to follow him, and the trio do. Juroot leads them to a familiar place: the tree of Life, where Golan is standing to greet the Chosen One. Golan congratulates Richard on completing the quest and mentions that Richard has learned much from his quest, to which Richard readily agrees. Richard wonders if the pods were responsible for his growth, but Golan reads Richard's mind and disagrees, saying the manner in which he gained that growth is most important and will remain with him forever. Richard then recalls something and asks Golan who was the "one to guide Richard," since Richard had two companions on his journey, Orkan and Melek. Golan firsts takes the Life Force Pods and returns them to the Tree of Life, where they begin radiating a beautiful gold. 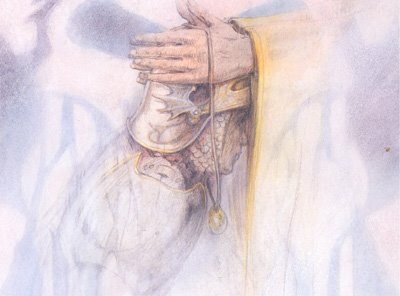 Golan then answers that neither Orkan nor Melek was his guide - his guide was his inner self. By now the remaining Guardians have arrived around the tree and Richard turns to Orkan. He gasps when he sees Orkan wearing golden armor and carrying golden weapons, just like the other Guardians. Golan reveals that because of Armor's death, a new Guardian is needed to take his place, and it was Orkan's destiny to join the Guardians. Richard inquires about Melek, and a small figure dressed in vermilion robes steps out from behind the Guardians. It is Melek, and Golan explains that he had become the Keeper of the Sacred Runes and will be the leader of his people. Golan then informs Richard to say his farewells, as it is time for him to return to his own world. Richard feels like he is losing true friends, but he suddenly yearns for home and says his goodbyes to everyone. Golan thanks Richard again and remarks that the amulet Richard wears must remain in the Ancestral World. Richard nods and allows for the Guardian to reach for the amulet around his neck. As Golan reaches for the amulet, Richard suddenly sees a blinding flash above the Ancestral City. A towering column of blackness with two slanted red eyes can be seen above the city. It scans the battlefield for a moment before vanishing in the air, leaving a distinct image of the Evil One's mask. Had the Evil One truly been defeated? There is a lot I love about the twenty-sixth issue of The Ancestral Trail, and one thing I don't, but overall it is certainly a great way to..."conclude" a series. For starters, the Final Battle is perhaps the best battle in the entire series. It doesn't skim on the fact that people die in this battle on both sides, and goes through great lengths to show that sacrifices were made so that the Ancestral Forces could win this war. The battle took up a good chunk of the final issue, and every word was put to good use, making up for many of the short battles in earlier issues (see Enlil, Fenrar, Zyton, etc.). However, I do have to mention the one thing I didn't like about this issue, or at least one that is a little confusing. Throughout the battle, the Evil One is never seen directly, and he is never fought. The Guardians don't even seem to be concerned about him throughout the battle, focusing instead on the Evil One's forces themselves. Either this is a huge oversight on the part of the book's author, or there is another reason entirely. A possibility: could it be that the Evil One was never in the Ancestral World, he simply ruled over it using the creatures he created? Is that why the Ancestral Forces, even Golan, didn't bother with him once the final Cozard was dead and burned on the funeral pyre? But back to the good things: the image of the Guardians around the Tree of Life is perhaps one of my favorite in the series. A direct second is that of Juroot fending off Cozards with his mace while standing in front of a banner that shows the mask of the Evil One, an image so awesome that it was used for this issue's cover. Speaking of the cover, I love how the cover cleverly and subtlety informs the reader that the journey is not over yet, that the story hasn't finished. Notice how the ancient scrolls used for the title of each book are peeling away, revealing a bizarre, metallic-like plate? Anyone who has read the series beyond the 26th issue already knows what's going to happen, but those who don't can most likely take an educated guess. Finally, there are no cards for this issue because...well, they've been used up in the previous issues. "You have done well. Your task is almost done, but the Evil One's forces still hold the city. Not until they are destroyed can the pods be returned to the Tree of Life and the Guardians be reinstated. Only then will our world be secure." Juroot: "He is with us in spirit. Not until we reach the Tree of Life will he show himself." "A frontal attack would cost too many lives. There must be a compromise. The dwarf forces will go in ahead and tunnel under the walls. They will give a signal when they are ready to open the gates. Oganga and his bird forces will create a diversion from above. Insect scouts will keep the Guardians informed of enemy activities throughout. The rest of us will divide into four groups and be ready to advance simultaneously when we get the signal. Zard, you take your troops through the west gate, Tuska take the east and Kika the south. Richard, Melek and Orkan will join me and go in through the north gate. Remember the Evil One's forces will be ready for us. Be vigilant and good luck." "It's finished. Our lives can begin again." "Don't worry, the pods have contributed much but their true wealth lies in the manner in which you gained them. The value of that experience will remain with you forever." Richard: "Who was the guide you said would help me? You mentioned only one, but Orkan and Melek were with me all the way." Golan: "Yes, I said there would be one to guide you, but it was neither Orkan nor Melek. Your inner self was your guide."